Want super-smooth, touchable pins but don’t want the hassle of daily shaving? Look no further - epilating might be the thing you’ve been looking for. If you’re reading this and wondering what an epilator is, it’s essentially an electric hair removal appliance that acts like a giant set of tweezers which when moved across the surface of your skin catches and removes all of the hairs in its path. It sounds pretty harsh and if you’ve never waxed or epilated before then the first couple of times are going to be uncomfortable. However, the more you do it, the weaker and finer the hairs get and the less painful they are to remove so it gets easier and easier over time. The results are worth the initial discomfort - we promise. If you are really squeamish about pain, some women take a mild pain-killer 30-60 minutes before the session to take the edge off but it’s definitely not necessary. 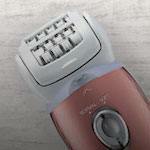 Unlike shaving, epilators remove hair from the root which means it takes longer to regrow. Rather than having to shave every couple of days, most women use their epilator once a week and still achieve super smooth pins. Also, because the hairs grow back finer and fewer, hair regrowth is softer, less prickly and less visible. Once you’ve been depilating for a while, even if there is a bit of regrowth, it’s barely noticeable either by eye or by touch so you can get away with it that bit longer! As with most things in life, the better the tools the better the job, so choose a good quality epilator, there are lots of options to choose from all at different price points. Keep in mind you will be using it regularly so it is worth investing a bit more for one with all the features you need. Where you intend to use your epilator will affect your choice as not all can be used on the bikini area as well as arms and legs so check it’s suitable for your requirements before you buy. Unlike waxing, shorter hair is much better for epilating and hair should never be more than 1-2mm long. If your hair is longer than this, shave a couple of days before you plan to epilate; it will be so much more comfortable. Epilation is not instant and when you first start it will take you a good 30 minutes to do both of your legs, so don’t attempt it if you’re in a rush. Set some proper time aside, preferably in the evening so that any post-epilation irritation is gone before morning and take your time. Regardless of whether your epilator is wet or dry, a soak in the tub for at least 10 minutes before epilating is a great way to prepare the skin and hair. Epilators work best on clean skin free of natural oils, moisturisers and lotions. A good soak will cleanse the area, open the pores and soften the hair making it ready for the session. When epilating you do need to be vigilant about your exfoliating regime to avoid ingrowing hairs which are quite frankly a pain in the neck. It doesn’t matter whether you dry brush, use a loofah, a body scrub or a shower mitt, just make sure you do it regularly and certainly before every hair removal session. Exfoliating will remove all dead skin cells from the surface of the skin and help uncover any hairs that have got trapped under this top layer. It also makes your skin feel super smooth too which is an added bonus! Start by epilating the hairiest parts of your body first; on your legs this is generally the inside of your calves. As well as being the hairiest, it is also the least sensitive so it gives your body time to adjust to the sensation before moving on to the more sensitive area such as around the ankles. Pulling the skin taut, hold the epilator at 90 degrees to the body and glide (don’t push) the epilator smoothly and slowly across the skin in the opposite direction to hair growth (generally on your legs this means moving from ankle to thigh). Move in circles as you go to catch hairs which are growing in different directions and work methodically so you don’t miss a patch. The slower you go, the less risk there is of breaking the hair at the surface instead of being removed at the root and the less passes you will need to do. Slow and steady is the name of the game. It’s completely normal for your skin to be a bit red after epilation and a lot of women notice small red dots across the area treated. Don’t worry, it will subside over the course of a few hours. A rich body moisturiser will help soothe and rehydrate the area and keep your skin touchably soft. Look for a moisturiser containing with Hazel or Aloe if your skin is particularly sensitive as this will calm any irritation. Don’t forget to clean your epilator after every use to keep it in good working order and to ensure it’s ready for next time. For dry epilators simply give it a tap and use the brush supplied. For wet models rinse it out under water and then dry with a paper towel. Easy peasy! Once you get comfortable with epilating you’ll wonder how you ever survived without it, so give it a go, you’ve got nothing to lose except prickly legs!